*. The Distinguished Service Medal for Captain Sue Dauser. She received the award for her duty as Superintendent of the Navy Nurse Corps during the prewar National Emergency period and during the war. She was the first nurse awarded with this medal. from Secretary of the Navy James Forrestal on 1 December 1945. *. The Legion of Merit, fourth degree, and Distinguished Unit Badge (Army) for Lieutenant Ann Bernatitus. She received the recognition for heroic action on Corregidor and Bataan (More about her story is mentioned here). *. Three Bronze Start Medals (Navy). One of these Navy Bronze Star Medals was awarded to Lt. 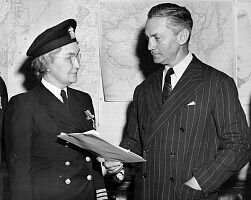 Commander Mary Martha Heck, (NC) USN, for “meritorious service” and “untiring effort” as chief nurse at a Naval Base Hospital in England. She insisted that the honor has to be distributed evenly among the 99 nurses in her charge. *. Eleven Bronze Star Medals (Army) and eleven Gold Star Medals (Navy) in lieu of Second Bronze Star Medal and eleven Distinguished Unit Badges (Army) for the POW nurses who were imprisoned on the Philippines Islands (Their story is mentioned here). *. 44 Commendation Ribbons with Medal Pendant. Several Navy Nurses who served abroad the USS Bountiful were among the receivers. *. Thirteen Navy Nurses who were abroad the USS Solace during the attack of Pearl Harbor received citations for outstanding performance of duty under fire by Admiral Nimitz in December 1943. Below is a list of decorations that Navy personnel could receive for their service generally and for service in campaigns during WWII. .v The American Defense Medal was awarded to all military personnel including nurses, for honorable service of twelve months or longer, at any time between September 8, 1939 and December 7, 1941.